- A pinch of flour thrown on the oven floor burns and smokes at 270°C and higher. - One drop of water sprinkled on bricks evaporates under 100°C. - When a drop of water scatters into fine droplets in contact with the sole, the temperature is above 200°C. - After grilling, just put the coals on top of the grill spot. All greases and meat juices will burn off. 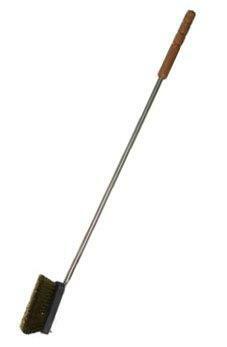 - To eliminate all marks left by ashes after sweeping, use a coconut brush with a long handle. Dip it in cold water beforehand to prevent it from catching fire. - It is important to light the fire at the entrance of the oven , under the flue, and using pieces of dry wood. 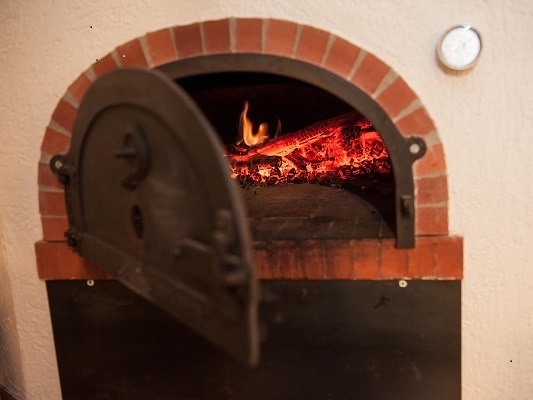 - In order to always have dry wood to start the fire : put it into the oven while it is still warm (not hot). Of course, the oven has to be cleaned of all ashes beforehand. - Getting the best out of your oven without loosing any time: always plan to cook with an open oven first, then with a closed oven. - Drying tomatoes, fruits with pits and certain mushrooms requires several sessions. Dry these foods in two sessions at a three day interval, reheating the oven each time. - Drying herbs: put the herbs on the swept oven floor (in a cooling oven, not more than 30°C and close the exterior door). The oven is extremely dry, the brick will absorb the moisture from the herbs in 24 hours. - Drying apples :Peel an apple and cut it into 2 mm slices. Put them side by side on a grill in the oven at 50-60°C. In one night the apple slices will be dry and crispy. - Preserves : Any type of food canned at home be sterilized in our oven. In the past, this was the only way to preserve jars of peas or green beans. - Bedding : Years ago, bedding made of natural material was placed in a clean oven and heated to a temperature of about 70 °C. It was left in the oven until it cooled completely . All parasites were naturally destroyed. 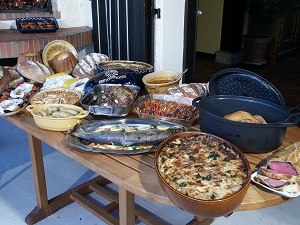 - If the oven is installed outside, it can also be a remarkable smoking chamber, with salmon or trout, for example. - Put an 8 mm layer of dry beech sawdust in a semi-circle around the edges of the oven floor. - After salting, the food to be smoked is placed on an elevated grill in the center of the oven. - Light the sawdust on one end. For about 12 hours, the sawdust will burn very slowly, giving off a great deal of smoke but no heat. This method gives excellent results. It is important to check the oven regularly, as the fire often goes out.